I have sold a property at 21154 93RD AVE in Langley. LOVELY, UPDATED basement-entry family home with a double car garage is in the heart of Walnut Grove and in one of the nicest neighbourhoods. This affordable two storey offers 5 bedrooms, 3 baths and numerous updates (roof, furnace, floors,painting and more). Entertain all summer long in your south facing, private, fully fenced backyard (perfect for kids and pets). It is within walking distance to schools, shopping and recreation. With freeway access and the Golden Ears Bridge minutes away, and the US border only 30 mins away this home is a must see! VANCOUVER, B.C. 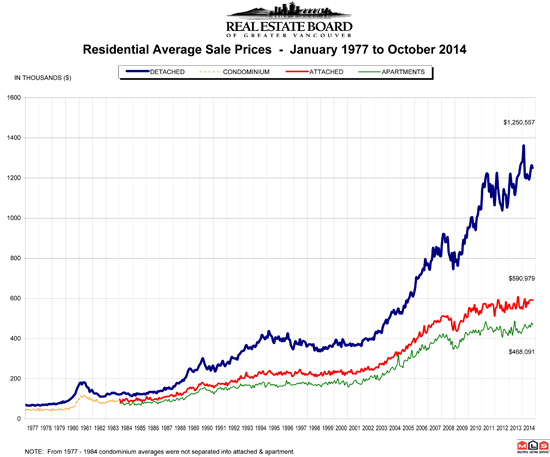 – November 4, 2014 – Home sales in the Metro Vancouver* housing market continue to outpace long-term averages for this time of year. The Real Estate Board of Greater Vancouver (REBGV) reports that residential property sales in Greater Vancouver reached 3,057 on the Multiple Listing Service® (MLS®) in October 2014. This represents a 14.9 percent increase compared to the 2,661 sales in October 2013, and a 4.6 percent increase over the 2,922 sales in September 2014. Last month’s sales were 16.6 percent above the 10-year sales average for October. “We’ve seen strong and consistent demand from home buyers in Metro Vancouver throughout this year. This has led to steady increases in home prices of between four and eight percent depending on the property,” said REBGV president Ray Harris. New listings for detached, attached and apartment properties in Metro Vancouver totalled 4,487 in October. This represents a four percent increase compared to the 4,315 new listings in October 2013 and a 14.7 percent decline from the 5,259 new listings in September. The total number of properties currently listed for sale on the MLS® system in Metro Vancouver is 13,851, a 9.2 percent decline compared to October 2013 and a 6.6 percent decrease compared to September 2014. The MLS® Home Price Index composite benchmark price for all residential properties in Metro Vancouver is currently $637,000. This represents a six percent increase compared to October 2013. Sales of detached properties in October 2014 reached 1,271, an increase of 19.1 percent from the 1,067 detached sales recorded in October 2013, and a 60.9 percent increase from the 790 units sold in October 2012. The benchmark price for detached properties increased 7.9 percent from October 2013 to $995,100. Sales of apartment properties reached 1,268 in October 2014, an increase of 15.5 percent compared to the 1,098 sales in October 2013, and a 57.9 percent increase compared to the 803 sales in October 2012. The benchmark price of an apartment property increased four percent from October 2013 to $380,200. Attached property sales in October 2014 totalled 518, a 4.4 percent increase compared to the 496 sales in October 2013, and an 53.3 percent increase over the 338 attached properties sold in October 2012. The benchmark price of an attached unit increased 4.7 percent between October 2013 and 2014 to $479,500. I have listed a new property at 401 360 36TH AVE E in Vancouver. MAGNOLIA GATE. This a wonderful two bedroom, two bath suite with insuite laundry and storage room. Just installed all new carpet, flooring and painted top to bottom. Fresh, bright and ready for you to move in. There is a large balconcyoverlooking the courtyard and this lovely end unit has full views over the park next door. Easy access to the bus, a quick ride to Oakridge and the Canada Line. This is a well managed adult oriented building situated in a quiet residential neighbourhood. Gas fireplace, eat in kitchen and a formal dining room for having the family over. YOU'LL LOVE IT. I have sold a property at 2761 GEORGIA ST E in Vancouver. Outstanding renovation by a Georgie award winning contractor. Completely redone for their own family home. This two level, four bedroom, two bath home is move in ready. Updated everything. The main has radiant in floor heating, vaulted ceilings with skylights, Brazilian cherry wood flooring and a feature gas fireplace. A chef's kitchen that is bright and spacious with butcher block countertops, stainless steel appliances and a breakfast bar/eating area. Spa bathroom with oversized soaker tub. French doors lead onto the large two level deck with gas hookup and pergola overlooking your enclosed backyard with mature landscaping. Downstairs is a well appointed two bedroom in-law suite with it's own laundry, covered outdoor stone patio area and heated tile floors in the kitchen and bath. Custom mill work, tile, closet organizers, on demand hot water and a large secure storage. Cedar shingle siding, a new front porch and stamped concrete pathway. Easy access downtown and "The Drive" YOU'LL LOVE IT!